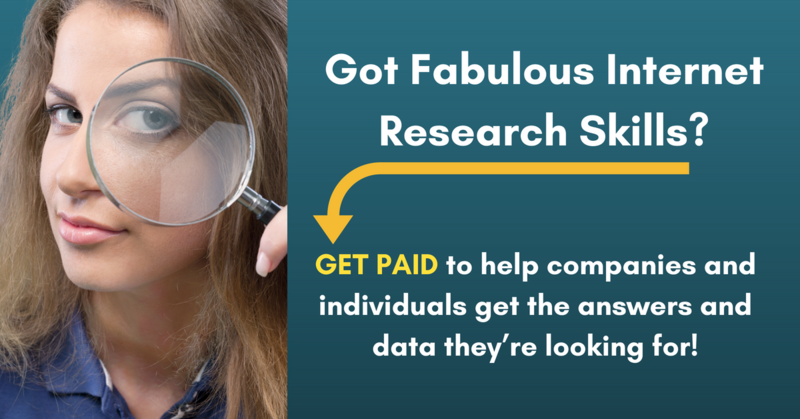 Got Fabulous Internet Research Skills? Get Paid to Use Them! Do you have crazy good internet research skills? Here’s your chance to use them to help companies and individuals get the answers and data they’re looking for. How much alcohol is consumed each night, worldwide? I need information on college/university debt and costs in the US, and how that has changed in the last 25 or so years. How many gyms in the US provide equipment for boxing? How much time does the average person spend browsing Netflix before watching? Wonder Researchers have to provide in-depth responses from reliable sources! For example, click here to see the research results for the question about alcohol consumption. Click here for full details and to apply. For more jobs and gigs like these, see our Newest Jobs & Gigs page. To be the first to hear about jobs like these, like our Facebook page, and check your feed for our posts. This entry was posted in Earn Extra Cash, Independent Contractors, Work at Home Jobs and tagged AskWonder, Internet Research, Wonder. Bookmark the permalink.